My friend and fellow dietitian Ellie Krieger knows a thing or two about healthying up indulgent foods. But when I saw how much she lightened traditional hot wings in her new book Comfort Food Fix, I was amazed. 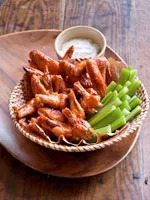 By boiling the wings and draining the fat, then broiling them, which helps remove even more fat (while still leaving them crisp), she took this favorite from total indulgence to smart weeknight meal.Preheat broiler to high. Place 2 pounds chicken wings (split at the joint) in a large pot and fill with water, covering wings by about 2 inches. Bring to a boil, then continue to boil for 10 minutes. Drain. Meanwhile, in a small bowl, combine 1⁄4 cup cayenne pepper sauce (preferably Frank’s RedHot), 1 tablespoon fresh lemon juice, and 3 tablespoons low-sodium chicken broth. Transfer wings to a broiler pan and broil, 5 to 6 inches from the flame, until the skin begins to blister and brown (5–6 minutes). Turn wings over and broil 4 to 5 minutes more. Transfer wings to a baking sheet, drizzle with the reserved sauce, and toss well to coat. Place the baking sheet under the broiler for 1 minute to heat the wings and sauce together. Serve with extra hot sauce, celery sticks, and, if you like, blue cheese dip on the side. Makes 4 servings.